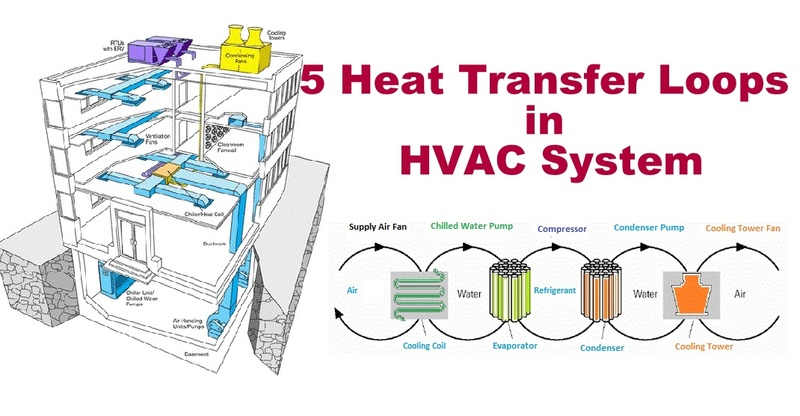 Several heat transfer loops work in an HVAC system .In these heat transfer loops heat energy is exchanged to achieve the ultimate purpose of heating and cooling of air in HVAC system. These heat transfer loops are basic organs of any HVAC system. Problem in any of these loops affects the HVAC system .In these heat transfer loops thermal or heat energy moves from left to right as it is extracted from the space and rejected into surroundings or air through five loops of heat transfer. In the left loop, indoor air is driven by the supply air fan through a cooling coil, where it transfers its heat to chilled water. The cool air then cools the building space or different HVAC zones. Driven by the chilled water pump, water returns from the cooling coil to the chiller’s evaporator to be re-cooled. Using a phase-change refrigerant, the chiller’s compressor pumps heat from the chilled waterto the condenser water. Cooling water absorbs heat from the chiller’s condenser, and the condenser water pump sends it to the cooling tower. The cooling tower’s fan drives air across an open flow of the hot condenser water, transferring the heat to the air.Thus cooling tower rejects heat to atmosphere in this way.